Yes folks, apparently the human robots of Daft Punk will be back to the states again this summer, doing 7 shows in North America. I can't verbally describe how amazing their Coachella 2006 performance was. 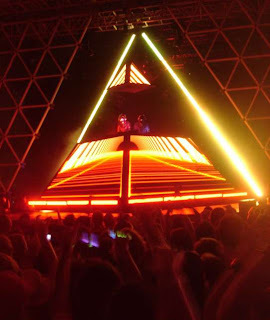 2 Robots on top of a multi-story lit pyramid, rocking a tired and sweaty crowd of thousands to a frenzy. Some dude in front of me was kneeling down on the grass after it was over and the house lights came on. His buddies said something like "hey Chris, lets go man!" He replied in a calm, quiet voice, "no, I don't want to leave just yet." If they come anywhere near your city, I definitely recommend making a night of it.